The second game in the Games for the Holidays promotion is here. This time around we’ve got a running, jumping, color matching game called Raskulls. 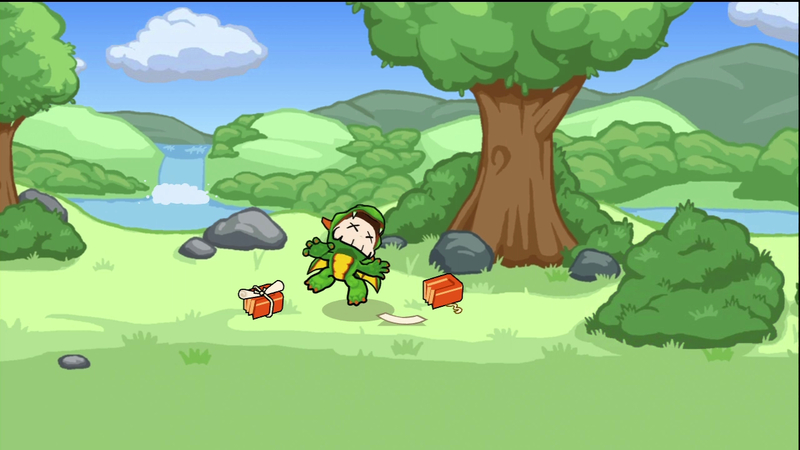 The developer, Halfbrick, is best known for their smash hit iPhone game, Fruit Ninja. We know that they can make an maddeningly addictive game for a palm sized touch screen. Are they up to the task of creating something worthy of a full console experience? There is a lot to look at in Raskulls. 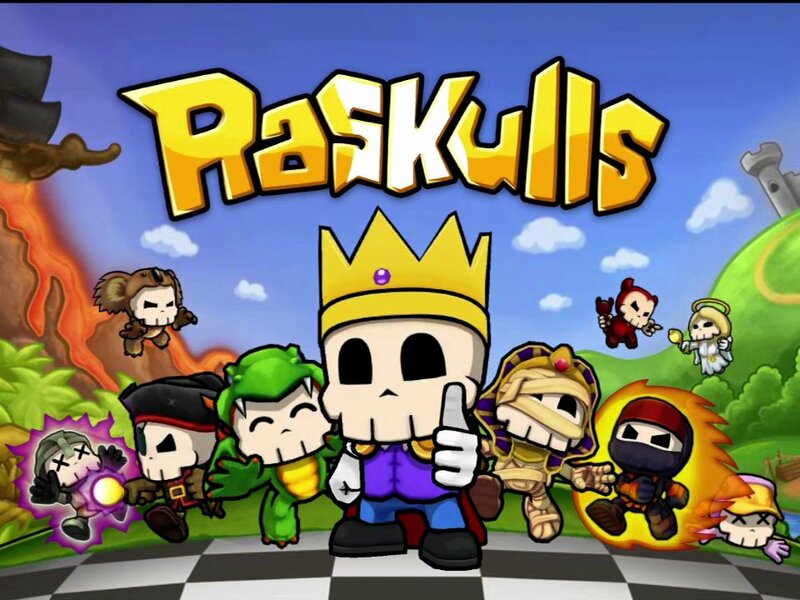 You play as one of the titular characters, varied group of diminutive little characters with skulls for heads and distinctive costumes. 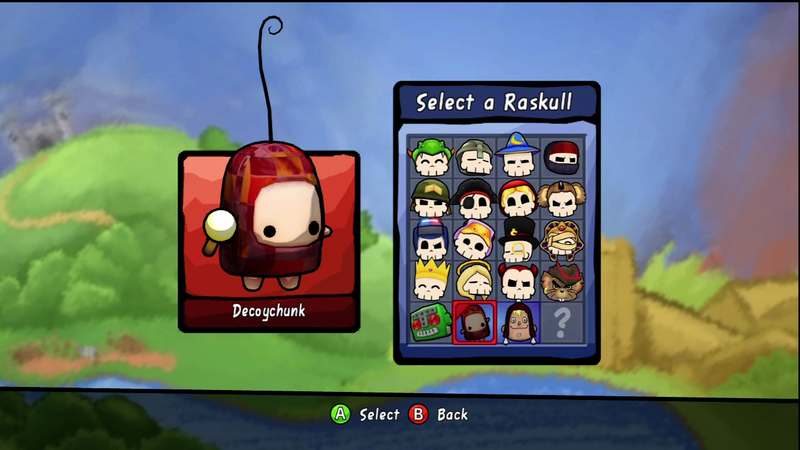 The outfits range from the standard knight/king/dragon of a fantasy setting to less genre specific archetypes like angel, devil, pirate, ninja, rich guy, duck, and even Mr. Destructoid. (Note to self: Create a BrainLazy mascot.) Pick up the other games in the promotion and you’ll get to play as a kefling and as ilo (or is it milo) too! Everyone is rendered in a frankly impressive cell shading. 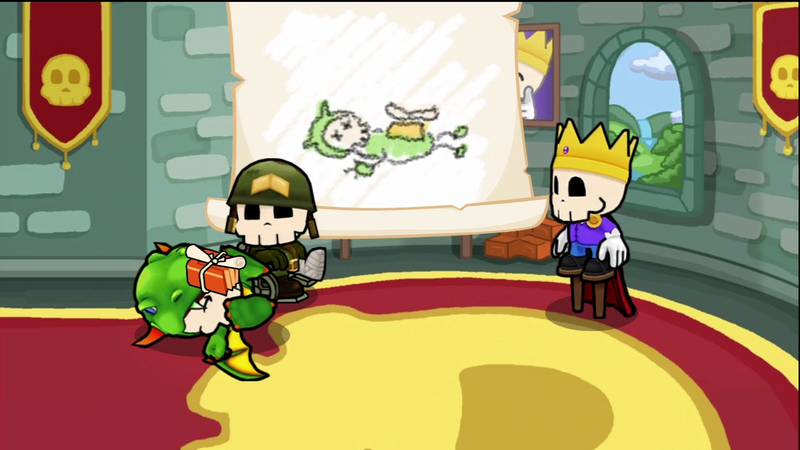 Aside from extreme closeups, you would almost think that the animation had been done frame by frame, ala Castle Crashers (a game that this game shares a great deal with, both visually and spiritually.) The levels themselves are wide and varied, too. ranging from forests to tombs to caves of both the ice and regular varieties, and the video game staple, a volcano. Each is drawn with the same level of personality, and skill as the main characters. Since the characters lack things like eyebrows, lips, a lower jaw, and other bits of anatomy vital to showing emotion, one would think that any “performance” that one might see in the story mode would be fairly sterile. Such is not the case. Using only their eyesockets, the characters manage a full range of emotion. No small feat. Outside of gameplay, the story of the game is told with limited animation vignettes which manage to be some of the high points of the game for me, but that’s got more to do with what I’ll discuss in the story section. In terms of in game visuals, you’ve got colored bricks, a frenzy meter, floating power-ups, and the currently armed power-up. The icons indicating which power you’ve picked up, as well as the graphical effects that accompany their use, are all just right. One tiny quibble I have is that once you’ve picked up a power-up, its icon floats over your head until you’ve used it. 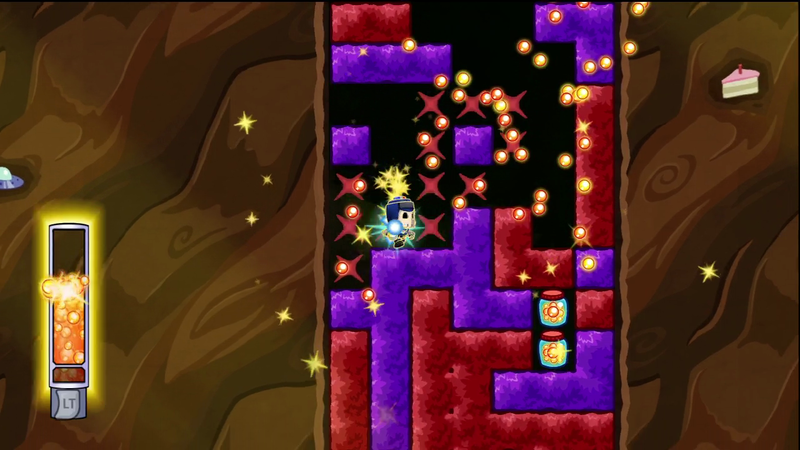 In some of the slower paced puzzle sections of the game, this can obscure the bricks above you. It isn’t enough to make the puzzle unsolvable or even more difficult, but it IS enough to bug me. That, though, is an extremely minor UI complaint in otherwise excellently executed visuals. It is colorful, lighthearted, and fun. From a glance at the screen shots, you might think that this was just another color matching game, but such a description falls woefully short. At its core, Raskulls actually has more in common with Mario Kart than Tetris. You can run, jump, and zap. Using these powers, you have to fulfill whatever goal the game lays out for you. Along the way there are invariably colored bricks. Contiguous brick formations of the same color vanish with a single zap. Anything formerly supported by that block dangles in the air for a moment before slowly descending. Scattered among these are skull bricks that take many hits to break, but if four or more touch, they vanish. That’s the central gameplay, and it sounds awfully simple, but even if you don’t include the power-ups we’ll discuss in a minute, things are still incredibly complex and strategic. 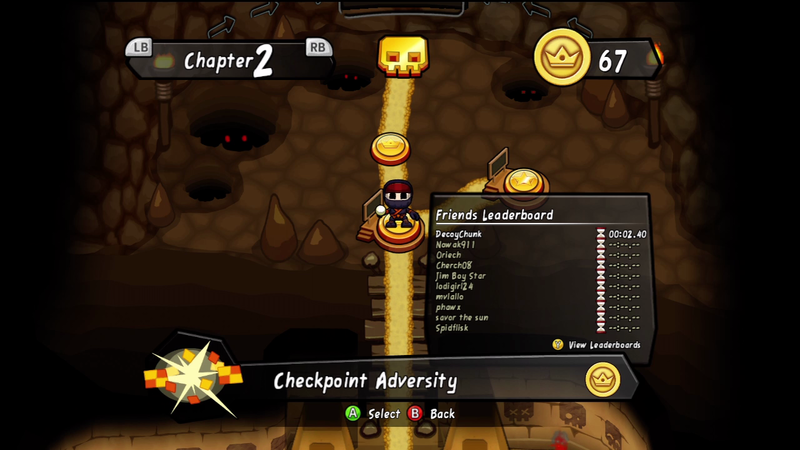 Let’s look at the primary multiplayer game type, race. Sure, you could just sprint through the level, hacking your way through the colored blocks until you reach the finish, but you probably won’t win. 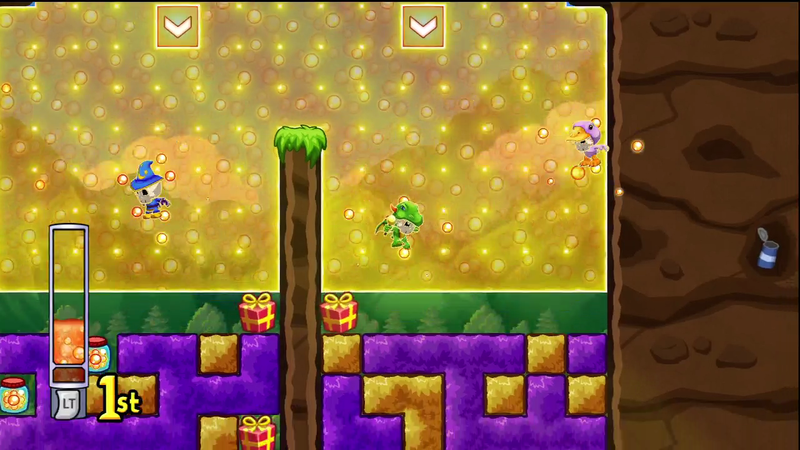 Every player runs, jumps, falls, and zaps at the same speed. If you want to cross the finish line first, you’ll have to get creative. Time a zap right and you’ll sail through a pile, leaving the rest of the blocks to fall down in your competitor’s path. Time it even better and those bricks will come raining down on their head, stunning them and gaining you precious distance. Often there is a way to clear away skull bricks in one hit, but should you? If you can clear a way just for yourself,the people on your tail will be stuck chipping through them. 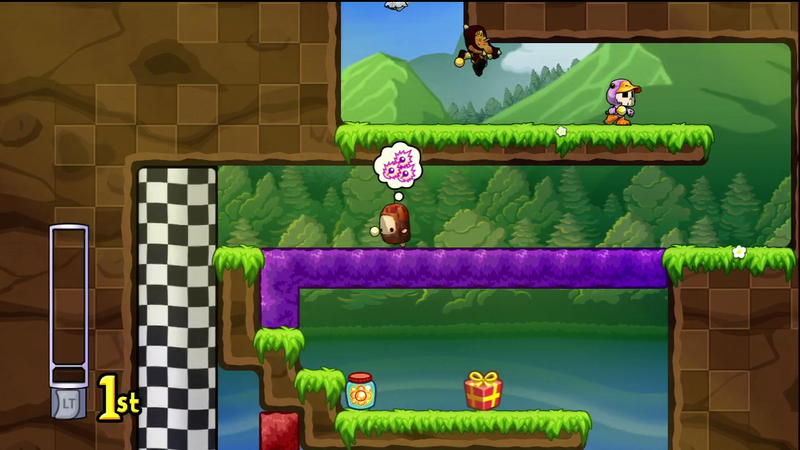 Things get even more complicated when you throw in the power-ups. Now you get thunder staffs that surgically destroy four bricks in a row, but don’t zap away the rest of the connected brick. 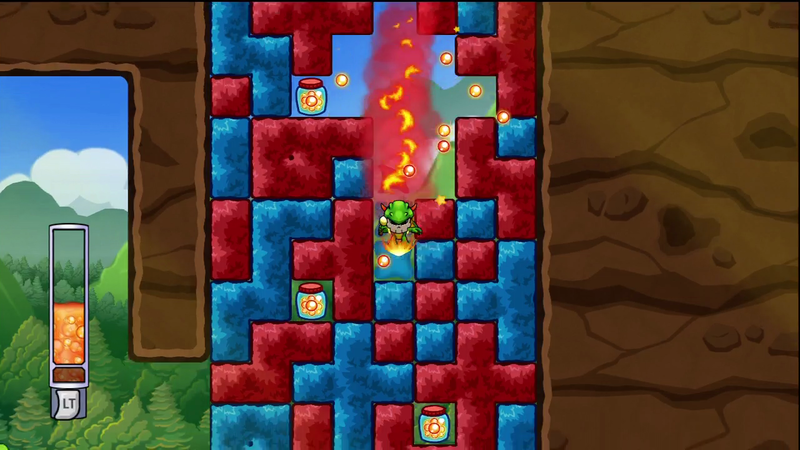 A fireball will allow you to similarly slice bricks, but this time by charging through them. It will also let you get a tiny, precious double jump if used while holding up, and will toast any opponents you touch. 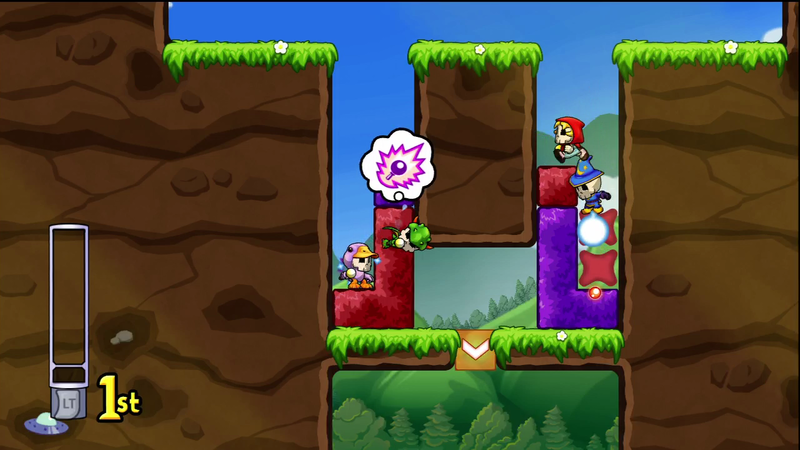 A ghost power-up lets you pass through (and remain undetected by) other players, a plunger steels their power-up. The list goes on, and every one can be used to cunning and strategic effect. There’s also frenzy, a meter that fills as you collect yellow orbs (or jars of them, or move through a yellow glowing chunk of the level). Once it gets full enough, you can active it, making your character run, jump, fall, and zap MUCH faster. So fast that you can hack through a skull brick almost as fast as a normal one. Frenzy burns up fast, and once you activate it, it runs until the tank is empty, so you’ve got to be choosy about how best to put it to use. Oh, and if something falls on your head, or you touch fire, say goodbye to your frenzy, so be careful when you’re passing through those brick stacks. I haven’t even touched upon the board design! Earlier I mentioned that you had to cross the finish line, but that’s not true. The finish line is actually a checkered block, and it isn’t necessarily a line. It could be VERY odd shaped, and touching any part of it nets you the win. That means that if you show up with no power-up, you might have to sprint to the end of a long room to touch it, whereas a late comer could boost up and touch a portion that, to you, was just out of reach. You can also jump off of fellow racers to reach it, which is as satisfying as it sounds. Often a long brick will bridge the path to the finish, and a racer that is lagging behind can pull the ground out from under you by zapping the brick, leaving you suddenly in the same boat, searching for the long way around. All of that would be quite game enough, but in the Mega Quest, you are presented with every conceivable variation on the theme. Maybe you need to finish a level without running out of frenzy. Maybe have a limited time, or a limited number of zaps. Perhaps you have to come in first in a race, or zap your opponents until they’ve dropped all of their money. There could be fragile items that must not have anything fall on them, or must not fall too far. You might have to sculpt specific shapes. Hell, any one of these variations could be combined with another one! There’s even a weird “tag” game, where zapping someone transfers a curse them, and you can’t win unless you cross the finish while uncursed. The variety is staggering, and every single variation is very well made and fun in its own way. Perhaps I’ve got a tin ear, but the sound of a game seldom makes an impression on me. The music properly sets the mood, frantic when you are pressed for time and smooth and calm when you’re dealing with puzzles. There’s no voice work to speak of, and the sound effects are appropriate. Everything you need, really. When I first started playing the game, I seriously wasn’t expecting much from the story. The plot is that a group of space-faring rodents called Pirats (get it?) are searching for the fabled planet of cheese when they crash land on our cranial heroes’ homeworld. Once there, they need to find a power source for their ship, and the precious “shiny stones” prized by the Raskulls fit the bill. The rest of the plot revolves around protecting/recovering said stones. There are three chapters, each focusing on their own specific cast members, and with subplots ranging from winning a tournament designed to lure out a would-be thief, to raiding a tomb, to finally bringing the fight to the villainous Capt. Turncoat himself. Seriously, even if this game had rotten gameplay, which it doesn’t, I would still recommend that you pick it up just for the humor. Raskulls is a spectacular game. 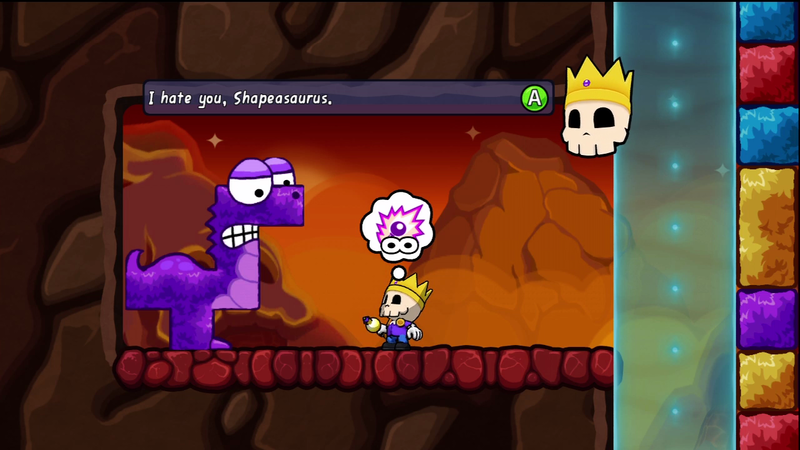 From single player that runs the gamut from devilishly tricky and careful to frantically fast and twitchy, a story that has some of the best gags in recent memory, and great multiplayer, there is very little here that is not to like. 9.8 / 10: A subversively hilarious, fast paced, running, jumping, color matching masterpiece.